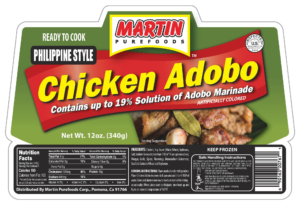 Home »Philippine Style Chicken Adobo 12 oz. »Philippine Style Chicken Adobo 12 oz. Philippine Style Chicken Adobo 12 oz. INGREDIENTS: Chicken, Soy Sauce (Water, Wheat, Soybeans, Salt, Sodium Benzoate; less than 1/10 of 1% as a preservative), Vinegar, Garlic, Spices, Flavorings, Monosodium Glutamate, Sea Salt. CONTAINS: Wheat and Soybeans. COOKING INSTRUCTIONS: Thaw product under refrigeration. Place Chicken Adobo in a non-stick pan and cover. Simmer over low to medium heat while stirring occasionally. When juices start to dissipate, turn heat up and fry to an internal temperature of 165°F. 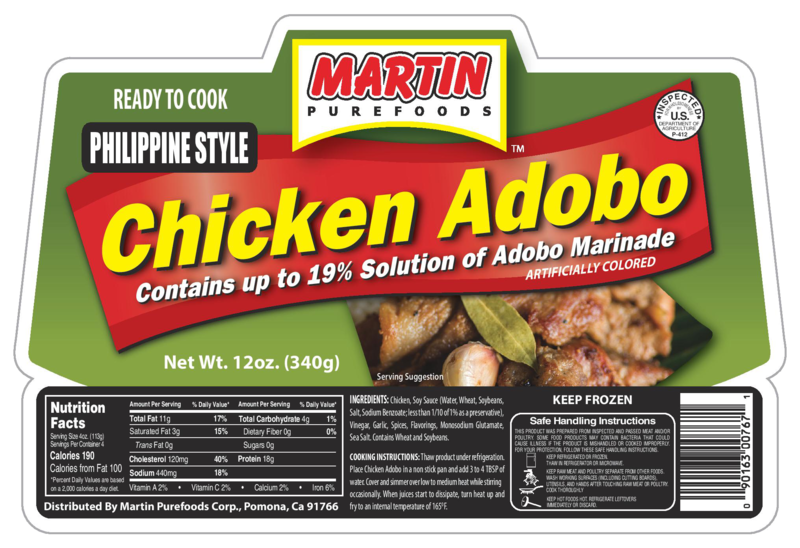 ← Previous Previous post: Philippine Style Chicken Adobo 12 oz.